Long-time Yosemite naturalist Carl Sharsmith was once asked what he would do if he only had a day to see Yosemite. "Madam," he replied, "I'd sit by the Merced River and cry." Certainly, one can spend a lifetime - as Sharsmith did - exploring Yosemite National Park, but if you only have a day, there are better ideas for how to spend it than weeping by the waterside. The highlights below are Yosemite must-dos. To maximize the time you spend enjoying Yosemite's natural beauty, pack a picnic or foods you can eat on the go - or stop by Degnan's Deli to pick up a portable meal that you can eat in a scenic picnic area. To get oriented to the Yosemite Valley layout before you go, explore a map. Best way to get there: Drive to Yosemite Valley via CA Hwy 140 through Mariposa. It's the most scenic way to get there. Tunnel view: On the way into the park, turn onto CA Hwy 41, following the sign marked Bridalveil Fall. Just before you reach the tunnel, stop in the parking lot for classic picture-taking and a panoramic view of the Yosemite Valley, where you can see all its icons: El Capitan, Bridalveil Fall, and Half Dome in one vista. If you have time at the end of the day, this is also a good place to return to at sunset. Glacier Point: Check at the entrance gate to find out if Glacier Point Road is open and if it is, continue on Hwy 41 to the Glacier Point turnoff. The road will take you to a panoramic vista point that overlooks the entire Yosemite Valley. Bridalveil Fall: Go back the way you came on Hwy 140 and continue into the Valley. After turning back into the park, stop at the roadside parking area for views of El Capitan and Bridalveil Fall. Take a short walk to the waterfall, following the marked trail. Yosemite Village: When you arrive in the heart of the Valley, park your car in a day-use parking lot and leave it there. You'll find the information center and a museum in the village, but your time is probably better spent outside enjoying Yosemite than inside reading about it. 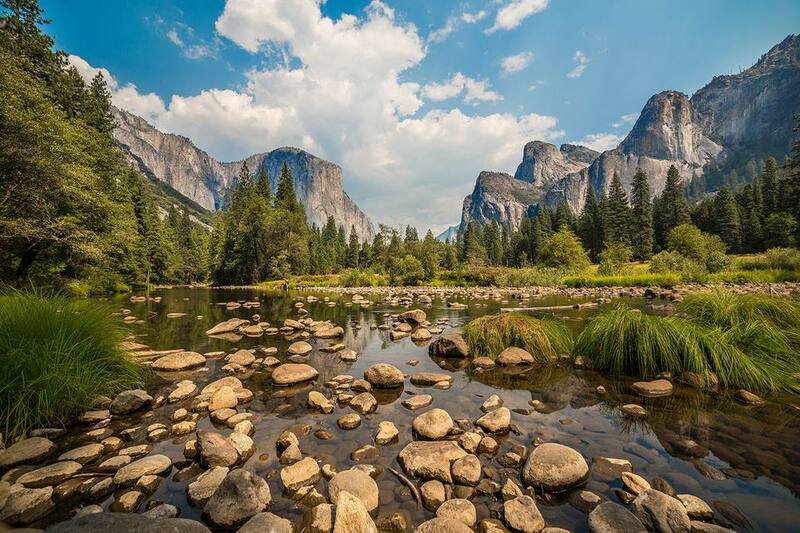 Guided Valley Tour: Yosemite Valley is the park's centerpiece, so plan to spend as much time as you can to tour it. If your budget allows, you can take a narrated, two-hour tour, which includes descriptions of the Valley's famous landmarks and history. It's an especially good way to see and learn a lot in a short time. Tours leave several times daily from Yosemite Valley Lodge at the Falls, which is at Shuttle Stop #8. To get times and make advance reservations, visit their website. Take yourself on a Valley tour: For a self-guided tour, energetic visitors can rent bicycles at Curry Village, or use the Valley Shuttle Bus to get a quick trip around the east end of Yosemite Valley. Start at Stop #1 or #2 in Yosemite Village. Stop #6 is the place to get a closer look at Yosemite Falls. If you have time for a short hike, get off at stop #17 for the Mirror Lake Trail or at stop #16 for a walk to the Vernal Fall footbridge. Both hikes are about a mile each way and moderately uphill from the shuttle stop. Ahwahnee Hotel (now called the Majestic Yosemite Hotel): Back at the Village, take the shuttle bus or walk to the historic hotel for a look around one of the grandest National Park lodges. On the way out: On the way out of Yosemite Valley, stop at Yosemite Falls if you haven't been there yet, at El Capitan Meadow to look for rock climbers high up on the rock face (binoculars are helpful) and at Valley View for a beautiful afternoon picture of El Capitan reflected in the river. After you reach the park entrance, it will take 5 to 6 hours to cover the stops above at a leisurely pace and an hour longer if you go to Glacier Point. Add an hour for each hike and add more time if you want to have a sit-down meal instead of a quick picnic. The surrounding mountains keep Yosemite Valley in the shadows for an hour or so after sunrise and shadow it again well before sunset. In winter, that will leave you about 8 hours of daylight to tour in and in mid-June, you'll have about 12 hours. However, summer crowds will make it harder (and slower) to get around. Spring and fall offer the best balance between long days and crowd levels.